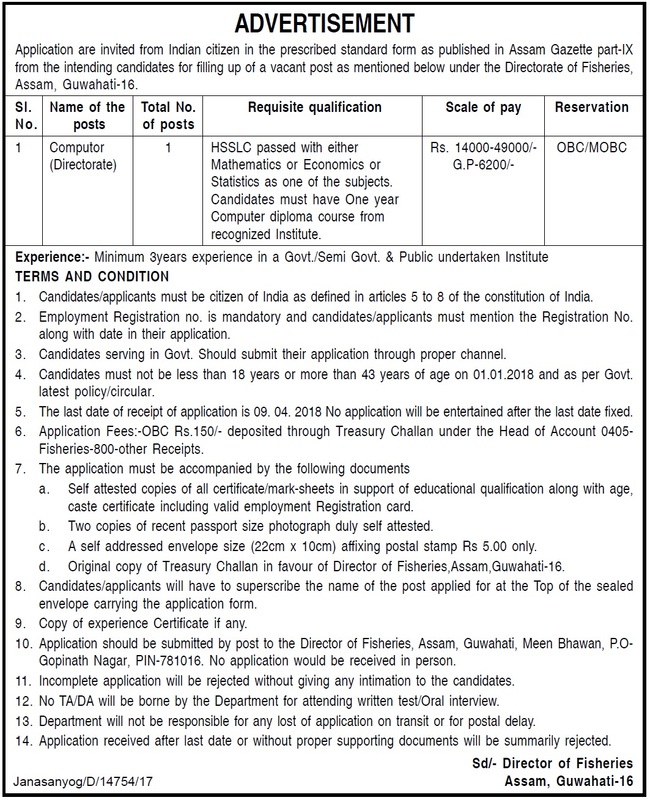 Directorate Of Fisheries, Assam Recruitment 2018 - Computor (Directorate): Application are invited from Indian citizen in the prescribed standard form as published in Assam Gazette part-IX from the intending candidates for filling up of a vacant post as mentioned below under the Directorate of Fisheries, Assam, Guwahati-16. Educational Qualification: HSSLC passed with either Mathematics or Economics or Statistics as one of the subjects. Candidates must have One year Computer diploma course from recognized Institute. Experience: Minimum 3years experience in a Govt./Semi Govt. & Public undertaken Institute. Age: Candidates must not be less than 18 years or more than 43 years of age on 01.01.2018 and as per Govt. latest policy/circular. Application Fee: OBC Rs.150/- deposited through Treasury Challan under the Head of Account 0405- Fisheries-800-other Receipts. a. Self attested copies of all certificate/mark-sheets in support of educational qualification along with age, caste certificate including valid employment Registration card. b. Two copies of recent passport size photograph duly self attested. c. A self addressed envelope size (22cm x 10cm) affixing postal stamp Rs 5.00 only. d. Original copy of Treasury Challan in favour of Director of Fisheries,Assam,Guwahati-16. d. Copy of experience Certificate if any. e. Employment Registration no. is mandatory and candidates/applicants must mention the Registration No. along with date in their application. Candidates/applicants will have to superscribe the name of the post applied for at the Top of the sealed envelope carrying the application form. Application should be submitted by post to the Director of Fisheries, Assam, Guwahati, Meen Bhawan, P.O- Gopinath Nagar, PIN781016. No application would be received in person. The last date of receipt of application is 09. 04. 2018 . No application will be entertained after the last date fixed.